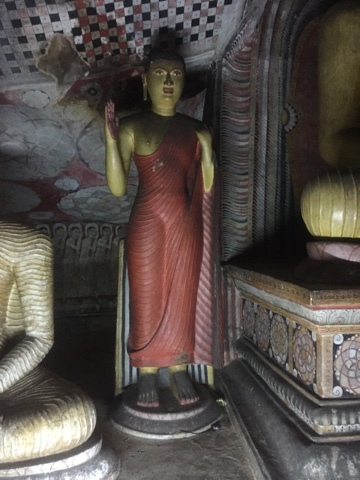 Yesterday we visited the Dambulla cave temples which were interesting as they ranged from 2,000 years to 200 and 100 years. There were frescos and tempera paintings but the 100 year old frescos had not adhered as the tradition had been lost since British colonisation. 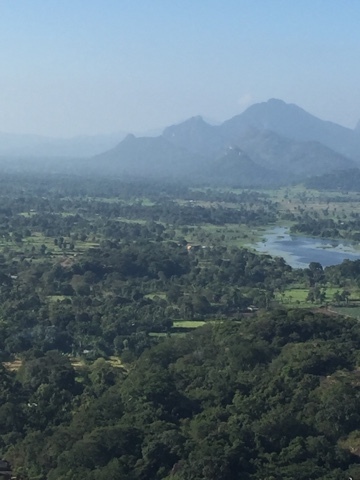 Visible from afar is a coloured flat top rock column of Sigiriya formation rising up from the surrounding plains. 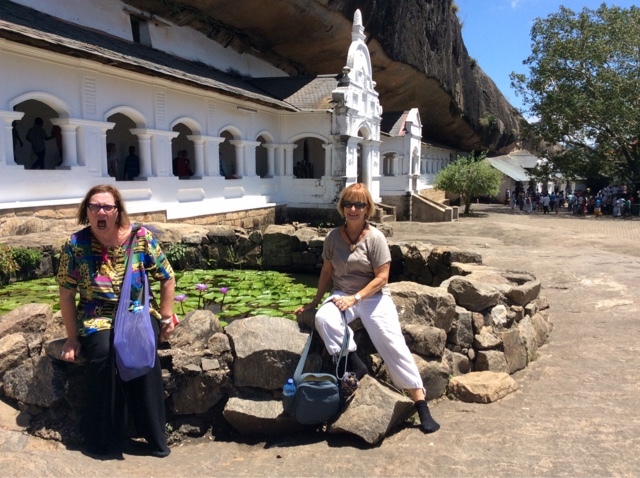 This is the 2nd world heritage site we have visited on our travels of Sri Lanka. 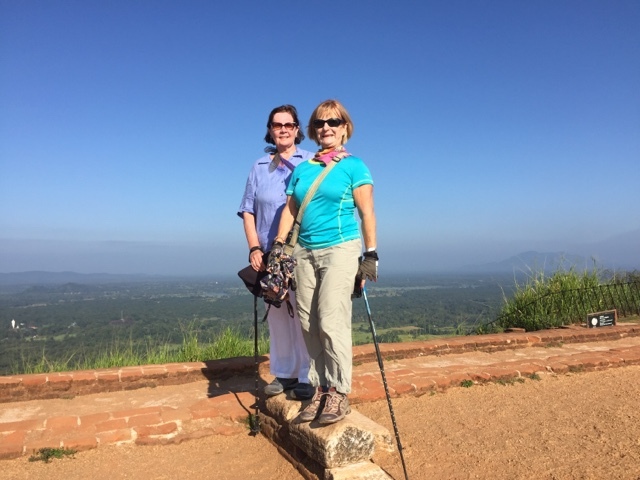 A steep climb of 2890 steps but worth the effort as the views are amazing. Situated under the rock and a canopy of trees are beautiful ancient gardens, complete with water features. 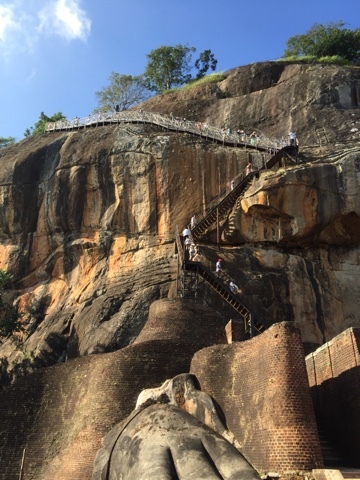 We began the climb of 2890 steps when the gate opened at 7am to avoid the heat. It was a brilliant suggestion on my part as we were ahead of the crowds. About half way up there is a cave with beautiful painted frescoes of women naked from the waist up. Continuing on along a narrow passage we came to an open area which is a great rest point. The steps continued very steeply for approx 15 minutes before we reached the top plateau, the views from the summit were incredible, we were surrounded by 360 deg of mountains as far as the eye could see. 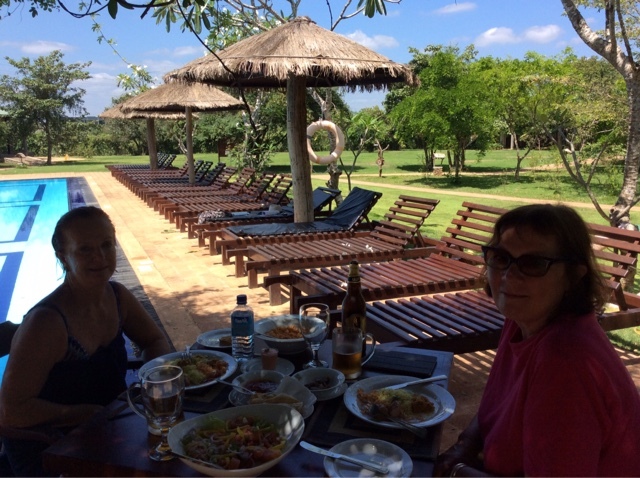 Returning to our hotel feeling totally exhilarated after our achievement, we cooled of with a refreshing swim, before beginning our Sinhalese cooking class. 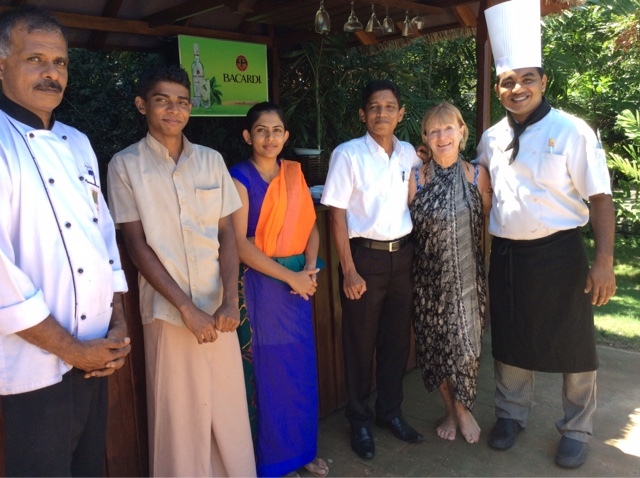 At the cooking lessen we were accompanied by the Restaurant Manager, newly appointed receptionist who was there to learn a new recipe, and 3 chefs. 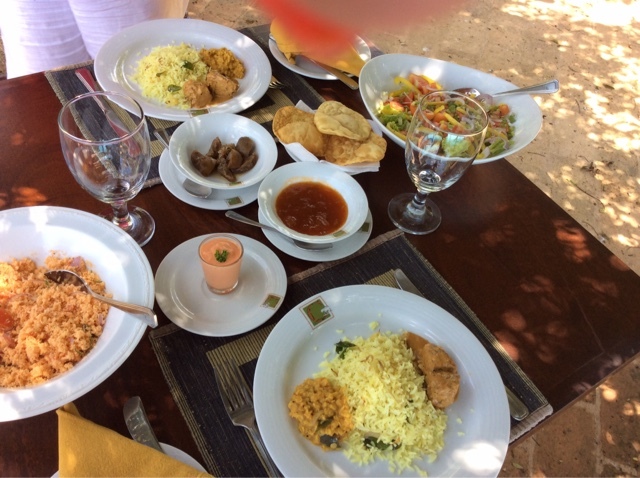 We began with making chicken curry, followed by yellow rice, coconut sambal, finishing with an Australian salad, which was quite hilarious. 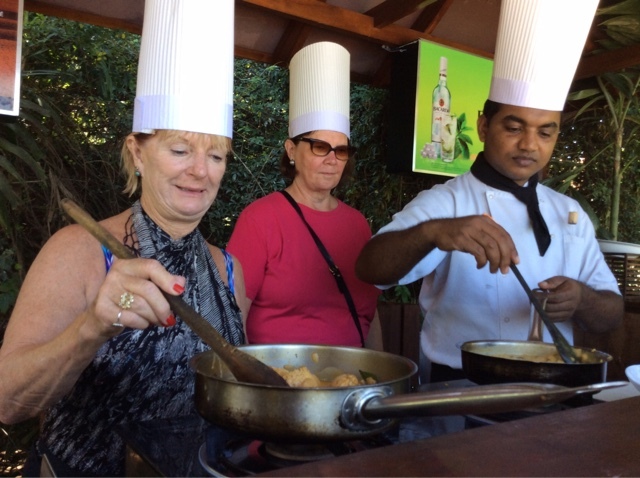 During the cooking demo we had many discussions about what we cook, compared to Sinhalese cooking, and have come to the conclusion after seeingcopious amounts of salt sprinkled into the cooking, that our food is more healthy. But having said that, we fingered that having this amount of salt in a hot climate must be good for you, especially when we are exercising so much, and my God it tasted delicious. Another quick dip in the pool without drowning after all that food, then we departed for our next expedition to visit a village. To get to this village firstly we had to ride in an ox cart along a very bumpy road for 15min - I even got to drive the cart with the young boy who is the owner running along beside us yelling instructions, not sure if it is to me or the ox. Arriving at our drop off point, our young boy being very entrepreneurial had a boat waiting for us. 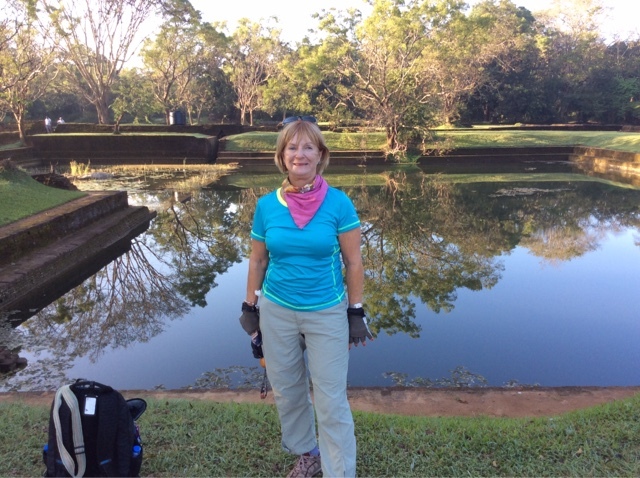 The lake which we were rowed across by the boy, is filled with many species of colourful birds, beautiful water lilies, and lotus flowers, with a view of Sigirya Rock, what a spectacular site. Just before we arrived at the local village of Agodawawa village our strong rower stopped to collect a lotus flower, and deftly made a necklace for us. This was a very touching moment on our journey. Arriving at a local home we were greeted by a lady and her two daughters who invited us in to see how to grind millet, husk rice and grate coconut with traditional kitchen tools. These were made into roti (bread) cooked between squares of banana leaf over an open clay fire. The roti together with a banana is their daily breakfast, which is delicious. To end a magnificent day, we enjoyed an Ayurvedic massage followed b a glass of wine. Or two!